Last Week in Review: Global drivers divide Fed outlook, while home prices continue to rise. Forecast for the Week: A deluge of data will be dissected the second half of the week. "Why must we always ride a divided highway?" Doobie Brothers. While many signs point to a U.S. economy accelerating on the road to recovery, global markets continue to put potholes in front of the Fed. As the Federal Reserve gears up for its next Federal Open Market Committee (FOMC) meeting April 26 and 27, the likelihood of an increase to the Fed's benchmark Fed Funds Rate has been detoured. Recently released FOMC March meeting minutes noted an increase to the Fed Funds Rate would "signal a sense of urgency" that is not "appropriate" at this time. The Fed gave a shout out to a range of labor market indicators, including strong employment growth and rising labor force participation. Gross Domestic Product also is projected to expand thanks to increases in household spending. But many FOMC members see the strength in household spending offset by weakness in exports associated with lackluster foreign growth and the stronger U.S. dollar. Minutes stated "a sharp, though temporary, deterioration in global financial conditions earlier this year had not been fully resolved." Global conditions have led investors to consider the safety of the Bond markets, including Mortgage Bonds. Since home loan rates are tied to Mortgage Bonds, this uncertainty overseas is one reason home loan rates have remained attractive so far this year. In housing news, home prices posted a 6.8 percent annual gain from February 2015 to February 2016, according to CoreLogic, a leading provider of housing analytics. Month-over-month prices also were up 1.1 percent from January to February. At this time, home loan rates are still hovering in historically-low territory. Interest rates on U.S. 30-year mortgages fell to their lowest in more than year following a steep decline in U.S. Treasury yields last week, mortgage finance agency Freddie Mac FMCC.OB said on Thursday. The average 30-year mortgage rate fell to 3.59 percent in the latest week from 3.71 percent the prior week, Freddie Mac said in its latest week survey. 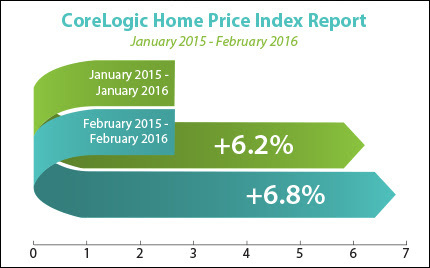 "This rate marks a new low for 2016 and matches last year's low in February 2015. Low mortgage rates and a positive employment outlook should support a strong housing market in the second quarter of 2016," Sean Becketti, Freddie Mac's chief economist, said in a statement. Federal Open Market Committee members will be keeping tabs on this week's spate of economic news as they gear up for their next gathering at the end of the month. The deluge of data begins on Wednesday with the Fed's Beige Book, Retail Sales and Producer Price Index, which measures wholesale inflation. The Consumer Price Index and weekly Initial Jobless Claims will be delivered on Thursday. The week culminates with regional manufacturing data from the Empire State Index.